With Evgeni Malkin taking in a full practice on Friday, the star center could realistically be returning to game action any day now, especially since he labelled himself as a game-time decision for Game 2 against the Rangers. It'll be a huge boost for a team that has already won 14 out of 16 games since he went down with injury, and the talk in Pittsburgh has revolved around where he'll play in the lineup once back, especially as the current 2nd line of Carl Hagelin, Nick Bonino, and Phil Kessel continues to find chemistry and have success together. It's a great problem to have, needing to figure out what to do with one of the best players in the game and someone who ranks 13th all time in postseason scoring average at 1.10 points per game, and it's a great problem to have because Mike Sullivan really can't screw up playing Malkin anywhere in the lineup. It's important to remember the crux of the decision without conflating issues that aren't relevant. There's no question that Evgeni Malkin is a better player than Nick Bonino, and that's no up for debate regardless of who lines up between current 2nd line wingers Carl Hagelin and Phil Kessel. It's also likely that the 2nd line would be better substituting Bonino for Malkin, although there is an argument that could be made to the contrary. The important consideration for Mike Sullivan isn't making the 2nd line as strong as possible, but rather making all four lines as strong as possible. And with the way the current 2nd line has played, keeping the line in tact when Malkin returns might give Pittsburgh the strongest lineup from top to bottom. That would seem to be the way that Mike Sullivan is thinking after using Conor Sheary and Bryan Rust on Malkin's wings during Friday's practice, though after his gamemanship with Marc-Andre Fleury's status it's fair to question whether that's a line he would plan on using in a game. However, it does present an interesting scenario to consider. That's a combo that would allow Sullivan to keep his current top two lines together, and they've both been playing extremely well as of late. Sheary and Rust give Malkin a pair of speedy wingers who have shown some scoring ability, while a 4th line of Tom Kuhnhackl-Matt Cullen-Eric Fehr would make an above average 3rd line and is something that no team in the league could match-up against if Sullivan decided to throw them out as his 4th line. The great thing about a player of Malkin's caliber is that it gives Mike Sullivan endless opportunities to consider. He could stack his first line with Malkin as the LW, Sidney Crosby at C, and Patric Hornqvist at RW to create a lethal top line that would give any team fits. He could keep Crosby and Malkin separated and have several different winger combinations that he could consider. Instead of Sheary, Sullivan could bump Chris Kunitz down to Malkin's line to balance his lines a bit more. Kunitz has shown to have good chemistry with Malkin in the past, while Sheary has shown that he can keep pace with Crosby in the limited time he's spent on the 1st line this year. Kuhnhackl is another possible winger who could add some physicality to the line, and with 10 points in his last 12 games Kuhnhackl is showing that he can chip in offensively as well. If he can get and stay healthy, Beau Bennett is another consideration for Malkin's wing. And if nothing seems like it's going to click, Sullivan always has the ability to reunite Malkin with Hagelin and Kessel. Any talk of trading Malkin or not playing him due to a small stretch of games where they've played great hockey is ludicrous. Evgeni Malkin is a generational talent, and the team is only going to be better for having him in the lineup, especially on the power play. But the high level of play that the Hagelin-Bonino-Kessel line has given over the past few weeks gives Mike Sullivan more options for making the best possible roster and being able to roll 4 lines that the opposition cannot match. 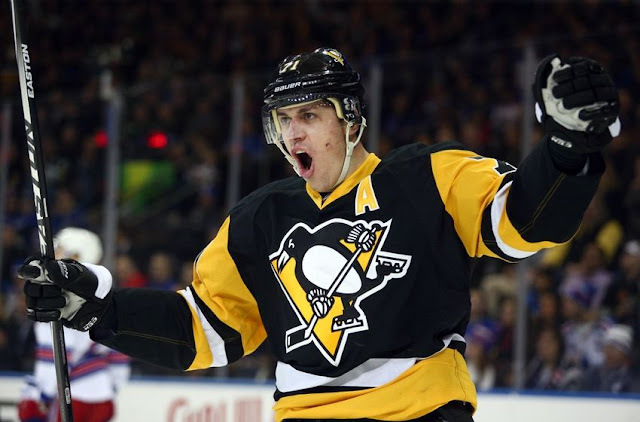 Whether he's slotted between the wingers he had when he went down, plays with Crosby, or plays with a new line entirely, Malkin coming back is a great thing for Pittsburgh and will only make them that much tougher to beat in a 7 game series.